Seeds for the Gospel are planted when we distribute bags of seed potatoes. These distributions include Gospel presentations sometimes delivered to beneficiaries by fellow recipients of the project. As Samaritan’s Purse helps Bolivian farmers build a sustainable potato crop, the Gospel is taking root in rich spiritual soil as well. A beneficiary of the Samaritan’s Purse seed potato project in Bolivia explains steps to cultivating potatoes in the mountainous terrain. The remote village of Patascachi, Bolivia, is an hour’s drive from the nearest village. It takes even longer by mule ride—a more common mode of transportation in this area. It is one of six remote villages in the region where Samaritan’s Purse is providing agricultural training and resources to farmers. We have provided farmers in these six communities with enough seed potatoes to plant a substantial crop. They have been blessed with great harvests. With this abundance they have created a market for selling to other villages or trading for other goods. “It gives them the option to exchange what they have for other kinds of foods like corn and fruit,” said David Hilaquita, a Samaritan’s Purse agricultural project representative in Bolivia. These potatoes also are yielding Gospel opportunities. This Samaritan’s Purse agricultural project now has created a mission field ripe for harvest, and the work is multiplying. Many Patascachi farmers have experienced the good that can come from a healthy potato harvest. And through the project, they’ve also experienced the power of the Gospel. At a recent distribution in their village, the farmers in our project helped spread the good news—not only about the seed potato distribution but also about Jesus Christ. Farmers brought a portion of their potato crop for a shared lunch that also included meat, cheese, and eggs. When our teams arrived, Patascachi was ready for us. The farmers gathered around the two Samaritan’s Purse vehicles parked near the town square and townspeople brought tables and chairs from their houses for their honored guests—the seed bringers. Farmers listened carefully as five of their fellow farmers performed a drama. They talked about how God had worked in their lives through the seed potatoes given to them by Samaritan’s Purse. They did this by acting out the Parable of the Talents from Matthew 25:14-30—using potatoes to represent talents. This unexpected creative presentation was followed by a lively potato farming lesson using illustrated posters. Farmers learned how to grow potatoes and build a better life economically for their families. They learned that God had given them the rich, cool soil and damp climate for growing potatoes and that they could use His gifts to bless many generations to come. After the presentation and the seed potato distribution, the farmers and families enjoyed a meal together, a potluck feast from a previous harvest, as they talked of the coming harvest they would reap from the seeds they’d just received. As part of a Samaritan’s Purse agricultural project in Bolivia, potato farmers are sharing the Gospel with each other using the Parable of the Talents in Matthew 25:14-30. Over the course of this three-year project, more than 300 Bolivian farmers have received seed potatoes from Samaritan’s Purse, and God has also produced a spiritual harvest. As He has worked through a very small thing—a seed potato—more than 100 people have received Jesus Christ as their Lord and Savior. Pray that as farmers receive the gift of seed potatoes that they also come with hearts ready for a Gospel seed. May they see through the gifts of God that He is offering the ultimate gift—salvation through His Son, Jesus Christ. 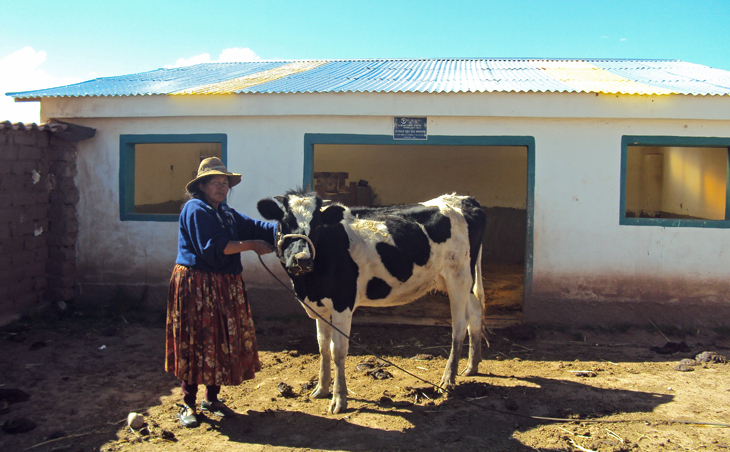 Bolivia Projects Nearly half of all children living in Bolivia's highlands suffer from anemia due to malnutrition. To improve the quality of life for children and their families, Samaritan's Purse provides agricultural and livestock training, feeding programs at schools, and nutrition education classes for mothers. Meeting people's physical needs is coupled with evangelism and discipleship opportunities pointing people to the ultimate source of life and hope, Jesus Christ.